A newborn's pulse rate is the number of times his heart beats per minute. This rhythmic beating occurs each time the ventricle of the heart contracts to pump blood through the cardiovascular system. A normal pulse rate indicates that the heart is functioning properly. 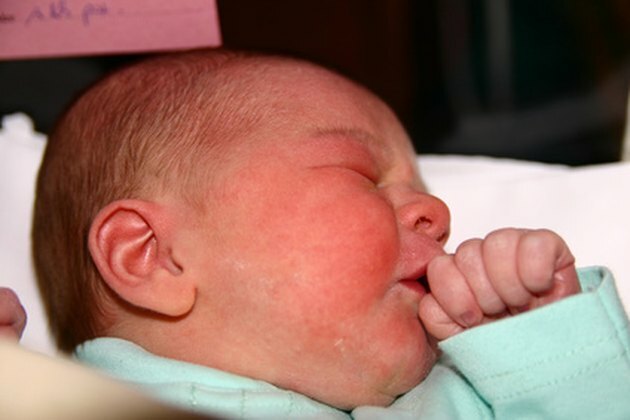 Checking a newborn's pulse is one of the first tests performed following birth. According to the New York State Department of Health, the pulse is the most consistent sign of circulation and oxygenation in newborn infants. The brachial pulse, which runs down the middle of the upper arm, and the pulse at the base of the umbilical cord are the best sites for checking a newborn's pulse. The umbilical pulse is accurate even after clamping and cutting. A normal newborn pulse is between 120 and 180 beats per minute. A pulse of less than 100 beats per minute generally signifies low blood oxygen levels. A low pulse rate is more medically significant than a high pulse rate in a newborn, according to the New York State Department of Health. A low pulse requires treatment with chest compressions and assisted ventilation. Intubation and medication may be necessary to raise the pulse rate to normal. Merck recommends checking a newborn's pulse when he is calm and quiet. A low pulse rate may indicate elevated intracranial pressure, long QT syndrome, congenital heart block, hypoxia or shock, according to the Advanced Life Support Group, while a high pulse rate may be due to cardiomyopathy, metabolic disturbance or another disorder.